The College was started in June 2001 with 14 Students in Commerce Stream Presently , The College imparts three Years Degree course in Commerce with specialization in Accountancy and Marketing to cater the needs of the industries of Vapi, Daman & DNH. 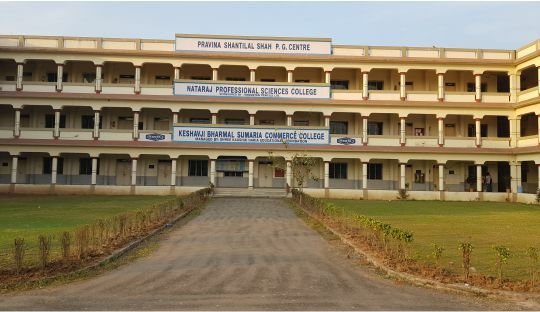 Not only this, the College also started Three Years Degree course in Medical Technology to fulfill the requirements of various Hospitals and Medical Laboratories of Government & Private Hospitals.The College had also started Three Years Degree Courses in chemistry, Computer Science, Microbiology. Our College is well staffed and resourced, enabling the students to benefit from a wealth of expertise which is reflected in the wide range of specialization at Under-Graduate Level. At the College, we value our Students highly and invest a great deal in their training. With the world of work in mind we not only offer specialized course leading to recognize the academic rewards but also have an approach designed to equip the students with skills needed for a rewarding career. Our focus of teaching and learning is always upon giving students the real life knowledge and practical skills required to give them a head start in their chosen profession. If students have commitment, ability and motivational approach they can expect great rewards exhilarating intellectual satisfaction and capability much sought after by employers in industries and academic institutions. Our aim at College is to offer an environment that provides opportunities that promote excellence and inculcate a culture of lifelong learning. The College is full of young, energetic and enthusiastic staff. To be the best and set the pace in the professional and education fields. To transform education into celebration. To inculcate the peripheries of vision and knowledge into true Self-Realization. To make students the center in cultivating a learning culture. Our effort in this direction would groom him/her for the effective contribution in his/her Professional and Social life.